Is a Half Hour Enough to Train Martial Arts? How can I practice martial arts and meditate when I have only a half hour available each a day? CAN YOU HELP ME!? Answer: Training for a half hour a day is good enough... if you use it everyday. The image above gives you a tip on how to use that time effectively, which I explain below. Oftentimes, small steps taken consistently over a long period of time is more powerful than sporadic sprints. I don’t even put in one half hour per day, every day, seven days a week, 365 days a year. I’d be much more advanced if I did. Use what you have available and take consistent steps in the right direction. If you’re not moving toward your goals, you’re moving away from them. 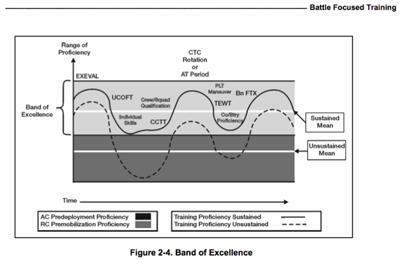 The image above is a graphical representation of the US Army's “Band of Excellence” (the Army has updated their training methods and replaced the “Band of Excellence” with “Just in Time”). “To combat the problem of fluctuating readiness levels in our troops, the US Army developed the concept of the Band of Excellence. The Army recognized that there were a number of 'core competencies' that any unit would have to remain proficient in if they were to maintain combat readiness. In the same way that you can only focus on one target at a time (if you want to hit it accurately), the Army can’t train on every single 'core competency' at the same time either. So, the Army recognized that systematic review and refinement of each of those core competencies was required. Monthly probably has too much lag time between skills and your effectiveness would drop too much in the other areas. Experiment and play around with the schedule until you get one that works well for you. You can rotate between forms, footwork, Wing Chun kicks, upper gate, middle gate, lower gate Wing Chun defenses... if you have areas you want or need to improve turn that into a focus and rotate it in. I haven’t done this in my own solo training, but thanks to your question I’ll be experimenting with this myself. Typically, when I do train at home I do the forms. That’s the least I can do right? At my kwoon, though, my sifu structures our classes with a weekly theme. For instance, last week was kicks, this week is double-arm blocks, side step, entries, etc. During each class of the week we work on a specific aspect of the theme. For example, side step against front kick, round kick, heavy pressure… full side steps, side step with counter kick, side step with with counter punch. It’s very effective especially if you make each and every class, which I haven’t been doing for the past few months! A half hour a day is good enough to train... especially if you use it everyday. If you only have half an hour a day to train, it probably means you can't get to class often, or at all. Wing Chun lessons by video, DVD, online, etc. is a good option when you can't attend a live class. In many other areas outside of martial arts online/video/distance learning technology has helped accelerate and spread knowledge and skills on all kinds of subjects. Many top universities like Harvard and MIT offer courses online, today. Check out edx.org or coursera.org. It's amazing where this technology is going. Learning Wing Chun is something you canNOT learn from Harvard or MIT, but you can through the Video MASTERY section of this site. It was developed for this reason. To allow you to learn, improve, and deepen your knowledge and skill no matter where you are, and on your available time. However, it's not perfect. Since Wing Chun is a physical skill, it's best to learn it live, with someone coaching you (like learning to swim or ride a bike). But if that option doesn't exist for you, or you want to polish your skills, or get a deeper understanding in some specific area of Wing Chun, video learning offers many advantages. That being said, beware of learning through YouTube. Especially in regards to Wing Chun. No doubt many helpful videos, on all kinds of topics, have been posted online, but most are not professionally produced. Therefore, they lack a lot of essential details and not presented clearly. This often leads to confusion, poor results, and bad habits. I recommend purchasing DVDs or video downloads from top sifus who have invested the time, money, and care into producing a solid product that carries their name on it. You can learn more about Video MASTERY here. Comments for Is a Half Hour Enough to Train Martial Arts? In fact, I have only one and half hours to train, during Mondays and Tuesdays.If you calculate it, it's 6 half an hour, meaning that there's one occasion I can't train in a week. What's more - It's not entirely Wing Chun, it's Shaolin Kungfu. We focus primary on Shaolin, and a few minutes was left for us to train Wing Chun - Sometimes no Wing Chun at all. But I was becoming better (in gradual rates). One of my favorite was to "use Wing Chun in everyday life". It doesn't mean that you'll go to the streets and smash everyone. What I meant is, to use Wing Chun techniques in everyday activities. Example, you open a door with jut sao on the knob, and a palm strike, when you enter the room, give a bong sao so that the door stops moving, then you give a palm strike to push the door back (Not too hard). Thanks for your tips. I'm totally on board with your "risky" suggestions. What I've come to realize is that consistency is key. It's better than binge training. And less stressful, which helps training.